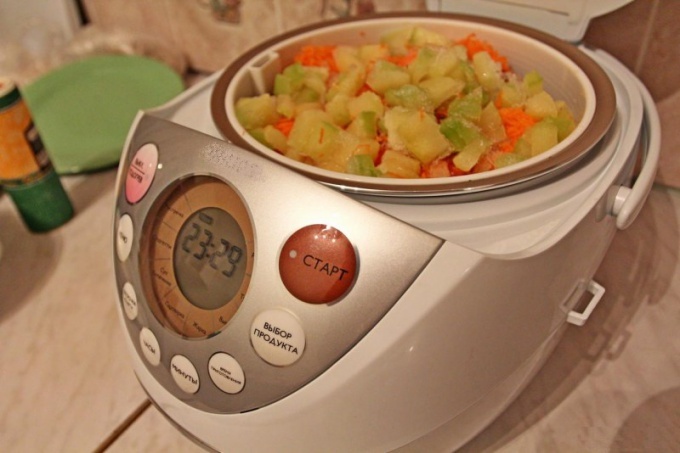 To prepare vegetable stew with beef in a slow cooker is much easier than on the stove. No need to be all in the kitchen and constantly to ensure that nothing is burnt, or the vegetables don't become watery, and the meat is dry. In a slow cooker stew invariably turns juicy and tender. - salt and spices to taste. A classic recipe allows changing color belokachannoy cabbage, Brussels sprouts or broccoli. You can also take each 100 grams. This will give the dish a more rich taste and attractive appearance. Cut meat into small pieces. Season with a little salt it and add tomato juice. Let promarinuetsya for 1 - 2 hours. Onions and carrots clean, chop the onion, carrot grate on a coarse grater. In the bowl multivarki pour vegetable oil, put promarinovalos meat, onions and carrots. Turn mode "Roasting" or "Baking" and cook for 25-30 minutes (cover to close tightly is not necessary). Potatoes peel and cut into cubes, add it to the meat when it is browned in half an hour. Set a timer for 15 minutes and continue to cook in the "Baking". Meanwhile, prepare the other vegetables: peel and cut in small pieces the tomatoes, the cabbage, the garlic, grate or skip through the frog, eggplant and Bulgarian pepper clear from the seeds and cut into strips. Attach the vegetables to the meat and potatoes, add the ketchup or tomato paste, stir, add salt, pepper to taste and cook the stew for another 20 minutes in the "Baking" under a tightly closed lid. When "Baking" the liquid from the vegetables evaporated and the dish will turn out dense. But if you want the stew was a hearty vegetable juice, at the last stage switch to the mode "Stewing" and set a timer for 30 minutes. Coarsely chop the beef, roll the pieces in flour. In the bowl multivarki pour vegetable oil, put the meat and fry in the mode "Roasting" with the lid open, until well browned. Put fried beef in a bowl, wash and wipe dry the bowl. Put on the bottom of the prepared vegetables: coarsely chopped potatoes, carrots, onion, garlic, celery. Add sliced lengthways mushrooms, cabbage (cut not necessary) and spices. Salt. On top put the fried beef. In a bowl put the tomato paste, attach to it beer and beef broth (if it salty, then in the previous step, do not add salt). Mix. This mixture pour the meat and vegetables in slow cooker. Tightly close the lid, set the mode "Fighting" 1 hour. At the end of the process, dissolve the starch in water, pour into the bowl multivarki, stir, cover, and cook another 5 minutes, then let stand in the "heating" mode for 20-30 minutes to evaporate as the oven. Spicy vegetable stew with beef is ready.